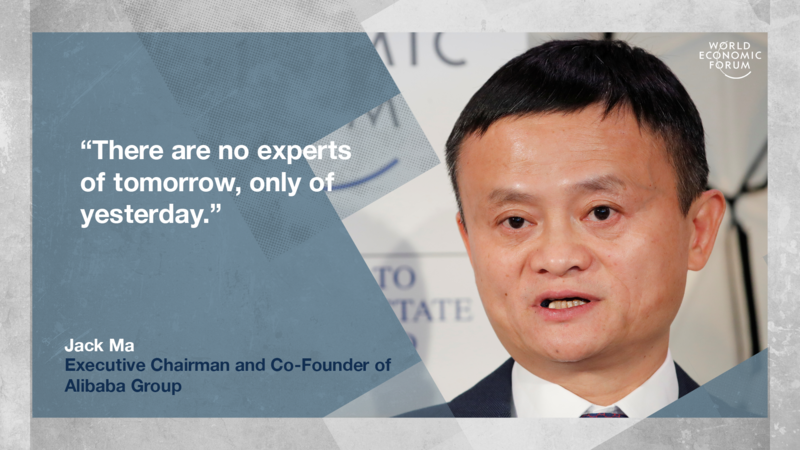 Jack Ma shares his thoughts at Davos 2019. Back in 1999, Jack Ma co-founded what would become the globe-spanning commercial behemoth Alibaba. 1. "Of course I was scared and had doubts [when I started Alibaba]. But I believed someone, if not us, would win. There are no experts of tomorrow, only of yesterday." 2. "In business, never worry about competition, never worry about the pressure. If you worry about pressure, don't be a businessman ... If you create value, there is opportunity. Today the whole world worries. That means there is great opportunity." 3. "Your first job is your most important. Not necessarily a company that has a great name but you should find a good boss that can teach you how to be a human being, how to do things properly, and stay there. Give yourself a promise: I will stay there for three years." 4. "How can we teach kids to be more creative and do things that machines cannot do? Machines have chips, but human beings have hearts ... Education should move in this direction." 5. What keeps Jack Ma awake at night? "Nothing! If I don't sleep well, the problem will still be there. If I sleep, I have a better chance to fight it." 6. "To manage smart people you have to use culture, the value system, they believe what they do. If you just want to use rules and laws and documents to control - that's how you control stupid people." 7. "When I hire people, I hire the people who are smarter than I am. People who four, five years later could be my boss. I like people who are positive and who never give up."